Are you facing a crucial interview and don't want to risk losing that job because you lack confidence or you think your interview skills aren't up to scratch? Fiercely practical, this book could be the answer to all your problems. Whether you only have a few hours to prepare or a few weeks, Julie Gray will guide you through all the techniques and strategies you need to give yourself the edge in a competitive market. 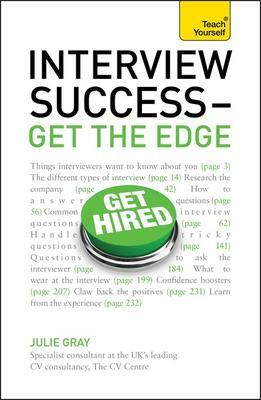 Quick and easy to use, 'Interview Success' makes it easy to focus on the areas of importance from avoiding clichéd answers to dealing with scary interviewers! Julie Gray (Hampshire, UK) works on interview skills and CVs with The CV Centre and a range of interview clients, and also works as a freelance expert for several major corporations.